According to a detailed analysis of AMD's upcoming GPUs, the new 7 nm Vega 20 might hit the 20 TFLOP barrier. Unfortunately, based on the known specifications of the hardware architecture used, achieving this level of performance would also lead to a high power consumption figure of 400 W.
Although AMD is not secretive when it comes to the upcoming 7 nm Vega 20 GPUs, the detailed specs of the next-gen Radeon Instinct video cards are still lurking in the shadows. AMD already provided a sneak peek at the upcoming 7 nm server parts, and based on what they unveiled, ASCII.jp concluded that the solutions based on the Vega 20 can break hit 20 TFLOPs of processing power. 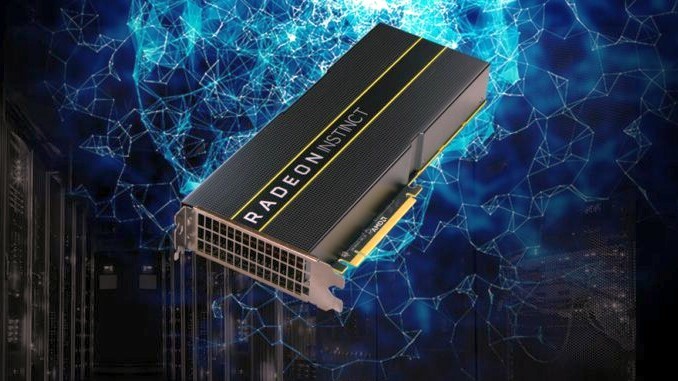 The source mentioned above thinks that the Vega 20 GPUs can be used to create solutions that would take on the Tesla V100, which has the advantage of one year spent on the market already. ASCII.jp's estimations put the Vega 20 die size at 360 square millimeters, which is a solid 70 percent reduction in total die size when compared to the Vega 10 chip. The most interesting part of the analysis mentioned above is that the Vega 20 allows building a solution with 40 percent faster clocks while using the same power package as the Vega 10-based cards. The problem is that this would also need more HBM2 VRAM (4 stacks instead of just 2), so it would all end up with an impressive solution that eats up over 400 W of power and provides well above 20 TFLOPs. At last, the more conservative — and more likely — approach involves a 20 percent clock increase over Vega 10, a TDP between 300 and 350 W, and a solid increase in performance of 65 percent (12.66 TFLOPs to 20.9 TFLOPs). Sadly, the price and production capabilities will not turn the AMD Vega 20-based solutions into products for gamers anytime soon. On the other hand, those who are still into mining digital coins might see it as a very tempting offering. The only problem is that we still have to wait at least a few months until the AMD Vega 20 GPU hits the market in large quantities, and many of the first ones to do so will probably be used in automotive and AI applications.